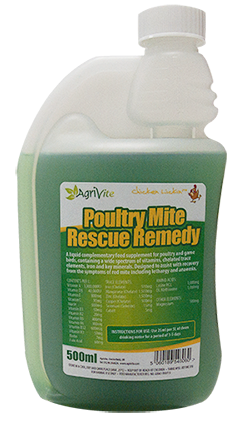 Poultry Mite Rescue Remedy is a liquid complementary feed designed to assist with the recovery of symptoms of a red mite attack such as lethargy and anaemia. Red Mite Rescue Remedy contains a spectrum of vitamins, chelated trace elements, iron and key minerals. Use during & after a Red Mite Infestation. Instructions for use: Use 25ml per 5 litre of clean drinking water for a period of 3-5 days.